Of Deed Record (Deed Record 331 Page 438, Allen County), Clarence and Minnie Kryder owned as personal realty the green shaded Lots plus Lot 71, Fairfield Terrace Sec. A. The green Lots were conveyed to the Kryder Company, Inc., and the Kryder Company, Inc. conveyed them to Alexander N. Pursley, Trustee March 31, 1942 the day after Magnavox Company Incorporated in Fort Wayne. The Trust Deed was not recorded till 1945 and is found in Deed Bk. 384 Page 246, in the Allen County Recorder's Office. The Lots listed on the Deed to Pursley, Trustee are: "Lots No. 81, 82, 85, 86, 89, 90, 94, 95, 129, 130, 138, 143, 145, 147, 148, 76, 21, 212, 231, and 232, in Fairfield Terrace, Section A., an addition to the City of Fort Wayne." 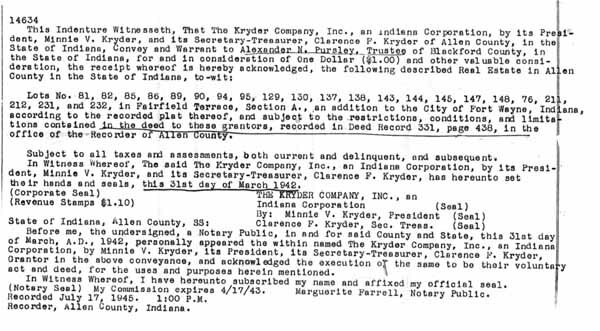 An exhaustive search of the County Records shows the conveyance from "The Kryder Company,Inc." to Pursley, Trustee in 1942 is the end of the Chain of Title.